279 Person has expressed his thoughts, Now you turn guys! Very cool template. I just download this template and I hope some can help me. I have problems with the featured posts.. ? @Benedicte : Hi.. There are 8 widget for featured posts/recent posts per label. For perfect view, You must fill all the recent posts widget as you have done for Helse and Electronics categories. I have some problem that I can't see posts title in Recent Post / Featured Post. How can I do? Please help me! What im doing wrong? In FEATURED POST 1 or 2 or 3 is nothing? OI only have to put the categorie? @Manuel Malvo : Hi... I can't see your blog. It just for invitation readers. Thanks .. it's Cool themplat ! First of all, congratulations for this awesome template! Well, when I add more than two featuredStyle widgets, the sidebar goes down. Could you help me, please? What am I doin wrong? @ireng_ajah: Thanks for the answer! But well, when I try to configure the other widgets, it gets one just down the other, as now you might see in the blog. What may I do? I'd also like to do not use featuredStyle 8 and 9. Could I, and yet this way the sidebar gets in its normal position? Its really a nice template, I have following questions about this template. 1. How to remove attribute"Powered by Blogger" ? 2. Just above powered by blogger I added a banner but it appeared to 125X125 how to show a banner on top? But now I have another trouble: in the index page, the submenu of the horizontal menu works fine. But if I open any post, it stops working. Do you know why? Check it on "Esparsos" submenu under "Categorias" menu. You should add the '#' (without quote) with link. @Wilhelm D. Mondschein : yess.. it will not work if you not add a link there. If you want menu Esparsos, Como baixa work, you should add a link look alike Livros, Mangas, etc. @ireng_ajah: Thanks! That wasn't what I wanted to do, but I fixed it. Is there anyway to show text and a thumbnail in the "featured post" instead of labels? @ireng_ajah: There's no problem about this. You really, really helped me a lot! Ireng, can you show me how to show the thumbnail and the quote of the last post in features post widget? @Nguyễn Việt Phương : Apologized. I can't for this template. It's very complex. Maybe my next template. Oh, so i'll wait for you. Thank you for reply soon, I´ve tried that and don´t works, I´ve tried adding html code in the template code and doesn´t, There is another way to make appear the post date? Thanks a lot!! I will try it out. I hope it will work!!! hey! thanks dude... I get it... Nice template man... good job! I just sent you an email, in regards to another challenge that I had with your Media Online template. Thank you, I tried that you said and It worked...You saved me jajaja. but I have another question: "How can I change the page numerator? I want It appears with page numbers and It only shows "newer page or older page" and I would want to know how to put 2 gadgets in the space of 1 gadget of the sidebar... I mean,I´ve put a random post gadget and It only cover the half of widht of the sidebar and the another half it´s empty and I was thinking that if I put 2 gadgets with the same dimensions It would appear covering all the space of widht of the sidebar. I hope I´ve xplained well my point, please answer me soon, I would love to. @CashCrate Insider : Hi.. Thankyou..
wow great template ,but i cant edit the menu .how?? Hello, I found this template perfect for my blog, however I would like to remove all "featured" or find a template like this and now without the 'featured'. It would also be helpful to remove the slide. Hi,, I tried the page numbering that you answered me, but it doesn´t work, I think that It´s a template defect... can It be fixed? Try to click POST, HTML etc from Homepage then click Older Post. I cant see my posts !!! why ?? hello ireng, i love your template so much. great work of you! 1. why the featured post on my blog show only in 1 column and not 2 column? why is the blogger templates widget and 'recent,popular,label' widget appear in the middle under the featured post? I want to out it at the right side. @sakura putih : Hi Sakura Putih..
FOr perfect view, please fill up the Featured Post per category. You can see the setting in my post above. Thanks for the reply irejeng. i`ve filled up every featured posts with labels, but it still didn't work as the preview. Any advice? I didn`t fill every featured post with the correct label. Now as I did correctly, everything went very well. Thanks again for your very helpful guidance. @ireng_ajah i've read through all your posts above and am still have problems! 1) i can't get anything to show up under the recent posts section? 2) the featured posts don't include featured posts, just the label name as the title. thank you for any help you can give! its a very nice template! sorry i have fixed it - didnt realise it had to be available to everyone for the widgets to work!! can i make a financial contribution to you and in exchange remove the backlinks to your sites? I want to ask if the drop down menu can have submenu for the submenu? Its very cool if you can assist me on how to add the submenu for the submenu. Thanks to the new link reference. I've try to modify the code and add the sub menu to sub menu. I've try many other option,from other reference but i don't know where i'm wrong. How should i change the coding? hey hi .. everyone .. i m facing one problem with this template whenever i use the first two featured post label columns .. the whole page disturbs. I mean that .. after i use the first 2 labels of featured post .. the page lines up all the featured post 1 below the other and everything looks bad then. Hey you done such a good Job, I like your this template.I want to ask 1 thing from you which is that I want to show my newly published post on my home page instead of features post which is from 1 to 8. Is there any methode to remove all these feature post widgets from template and show in this area newly published complete post? I'm maju from Japan with a started-up blogger webpage http://www.danmark.jp/ (a customized domain) and have some question for you. Would be very nice if you could help me. 1. On iPhone/iPad screen, normally websites can be zoomed in and out with fingers, but this template won't do so at all. (Totally fixed size) How can I do that to this template? 2. How can I change the title area and main area's back ground into white colour? 3. I'd like to make sure: this templates can be used for commercial use such as my future client putting their ad on my website at some price etc? NOT like my using the template for making a new web design for other people. the picture on the right is how I want the site to look like. 3. OK and don't worry, I haven't touched the original links. "© 2011 DheTemplate.com & Main Blogger"
won't be taken away. You are the one who created the design, right? "Supported by Makeityourring Diamond Engagement Rings"
also not to remove either? I wondered just because this link sounds like just a non-related ad. @maju : hi maju.. Great bro.. I need a little help for my template. 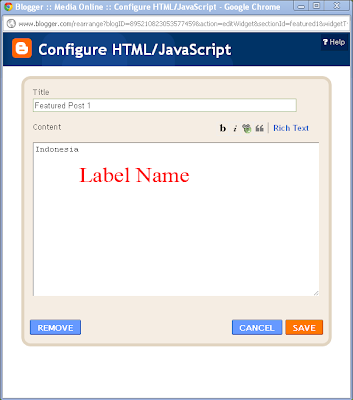 I use this template to my blog, but, how do i copy/duplicate TABVIEW (Recent, Popular, Label). Hi, thanks for this amazing template. I want to know how to activate the trackback in my blog, I tried do it with the traditional form of blogger but It didn´t work, I think It can be a template configuration problem. kalo dulu bikin tu tabview kode apa aja yang digunain? Googling ajah "Cara membuat tabview"
How can I adapt this template for rtl language? Hi, ireng I really admire you for this amazing template. I´d wanna know how to change the colors ( the posts titles, the backgrounds, the texts colors) and How to remove the slider. And about you said, Yes, I wanna continue using my actual template so can you say wich code can I delete of javasript and CSS when I remove the slider? The another things are solved now, just this question I still have. I´d know wich is the difference between the your template downloaded here in your web site and the downloaded in Btemplates.com, because I was viewing both templates and I saw one shorter. Hi again, I wanna know how to put a banner with my blog´s name and my logo in the header instead the text that appear as the blog´s name. and I would want to know how to change the menu colors too. 2.has been solved, now the background is all white and works fine. BUT the drop down menus are now unseen, that another problem for me. @ =DKDK Projekt : Hi DKDK Projekt..
Hi again ireng, I wanna know how to put a border to the sidebar widgets, and thank you for always being help us, God bless You. And I would wanna know too (This is not about blogs) are you christian? @team-elpuntocristiano : H again Team..
How can I change the size (width and height) of the slider? @. : G :. : Hi G..
Just one more thing: You forgot to mention that the complete width of the slider is 630px. Hi ireng, I wanna know why I can´t change the slider for a mootool slider, I´ve tried and when It preview It doesn´t appear. I think It´s a conflict with jQuery, and I wanna know wich is jQuery function in this template because I´m thinking about in delete all the jQuery code to can put the slide i want. Hi ireng, sorry, I wanna know too how to edit the slider you´ve put for don´t change the slider, I wanna know how to configure the slider to show at the right side panel only the little images and don´t titles. #team-elpuntocristiano : Hi Sir... May i know which mootool slider that you want to use? I want to show my newly published post on my home page instead of features post which is from 1 to 8. How to remove all these feature post widgets from template and show in this area newly published complete post? Hi, is there any way to show regular blog posts (rather than the label/feature boxes)? I'd really like to just have one or two regular blog posts on the homepage. Been trying to figure it out, but can't seem to. hi! on the sidebar where it has "Recent, Popular, Label", my post titles go out of the border. hope you could help me. thanks! @Marvin De Gracia : Great job, bro..
saya mu tanya kenapa tabview(recent,pupular) koq ada dibawah ya..tidak disamping? Lalu kenapa saya sudah hapus widget lama, tapi kenapa masih muncul ya? 1. can you show me how to show the thumbnail and the quote of the last post in features post widget? 2. i want to change black color of heading background? 3. and i want to remove RSS logo in my featured post which is place at the left hand corner. 2. The header use an image. You can edit the image in Photoshop or other drawing softwares. Thanks, gan! I love you muaaahahahaha! give me the solution to completely remove the rss logo with name. tapi setelah diisi semua tidak bisa juga..apa karena saya hapus isi di widgetnya ya..
tapi setelah saya upload template ulang..tetap tidak ada isi widgetnya..
mungkin bisa di cek kembali blognya. @hasplahrocket : jika aku meliat blog sobat, itu belum di isi semuanya..
1)they do not appear in two columns as they used two they now appear only in single column. it is very hard to customize now. 2)the featured post 1 and 2 are missing. But i urgently need the old and good media online please analyze and rectify the problem immediately and reply. man you are really great ireng this solved my problem for now. I really love this template man. thank u for taking this problem seriously. and also consider editing the template and testing the template and rectify all the layout errors. kalau cara membuat popolar post menjadi judulnya saja bagaimana (sama seperti recent post)? @hasplahrocket : kalo soal itu, itu ada settingannya di widget, um. Um bisa piliah apakah mau menggunakan image, deskripsi singkat ato judul saja ato perpaduan diantara itu. want to add Recent Post / Featured Post. hai ireng ajah came back for your help again. all i need is that the entire sidebar widgets should not appear in that particular page. help with the codes. 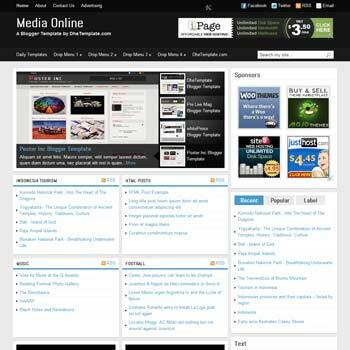 also please repair the problems I already mentioned in your template and provide a Fresh and new media online template. hi ireng ajah, im having problems just setting up this fab template. with all the changes with blogspot, im unsure as to what to put where. i have looked at your instructions but due to the changes with the site i am unsure if i amd doing the right thing. please help me out so i can start using your temp please..
@DirtyLINEN : Hi.. May i know your blog and specific description about the problem?? Will be possible show featured label contents with small thumbnail? Hi Ireng I wanna know how to remove the tabs (recent, popular and categories) wich code do I gotta remove? Very nice template, but i don't know why adsense don't show ads on every page on this template? Hi Goran : First, maximal Ads from Adsense are 3 ads. Second. Maybe you add the ads direct from Blog Post widget, not copy and paste the ads code to HTML widget. And put summary posts before or after featured box??? I add only 3 ads on page. Same thing when copy ads code to HTML widget, but never mind and thx for this great template. Hi Ireng...Thanks for your answer. I have been checking template code and I see that script summary post appear. There arent any single way to put summary posts before or later featured box?? I dont want summary posts for featured posts, only summary posts like others templates. I need to combine featured posts box and summary...Thanks a lot!!!! Please check. I make a blog with this template. The problem of your blog is the ads in top of featured posts doesn't appear. I added the add at top of featured post and everything is ok.
Hi Ireng now I wanna know how to change the sidebar widgets h2 color, I mean, I wanna the sidebar widgets title are orange. I wait the updates.....I hope soon!!! trus untuk mengisi link ya bagaimana? Maksud ssaya semisal tanda # saya ganti alamat, trus link jika diklik kodenya bagaimana? Contoh link nya bisa sobat liat dr dropdown menu di blog DheTemplate.com ini. untuk mengganti gambar fragmen yg di template ada 4 beserta review y, bagaimana cara biar itu gambar and reviewy bisa Q ganti jadi gambar Q..
Hi Ireng, What do I gotta do to align the sidebar widgets h2 title to center? Kalo soal itu, ada tutorialnya dipostingan.. Buddy, How can I configure Labels to show 10 posts when someone click on one label? now they´re showing only 5 posts. Ireng when I said - How can I configure Labels to show 10 posts when someone click on one label? I meant when some one is viewing any post and click on the labels of that post. I didn´t mean to Featured Posts labels. I wanna use this template, but using limited internet connection (max 3mb/s I only have it) I need more than 5 minutes to see my blog completely. How can I fix it??? I have given up and no switch back to the default template. As of this morning, the template seems to have some broken code? I have not edit the template since the day I installed it, so I'm not sure what happened. In the bottom footer, and in the right "Recent, Popular, Label" post section, I am getting big ! marks inside of a rectangle! Hello! Thanks for the really nice template! I need your help, though. I noticed that the slider is visible on every page of the site. How do I restrict it to the homepage only? Thanks. Hello! How do I change the footer so that it's not divided into 3 sections? Hello! Is it possible to change the featured post areas below the slider with a text or html widget? saya juga mas bermasalah templatenya, isi kotak tanda seru gitu, ini kenapa ya? btw saya sangat amat menyukai templatenya.. ^^ thanks. sorry pake bahasa Indonesia.. Saya sudah memakai templatenya semenjak bulan Desember..
Kalo saya liat url image yang rusak dan bandingin ma demo template, url imagenya semuanya berubah. is there a way to make the theme automatically adjust in size when viewed on a tablet or phone? i noticed that on the ipad i need to scroll to view the entire width. But, you should change the height featured posts too..
photos on my blog broke the frame, how to fix it?